Last week the Bureau of Meteorology announced 2013 was Australia’s warmest year on record, yet Australian newspapers published (at least) two opinion pieces denying the science of climate change. The first opinion piece was by Prime Minister Tony Abbott’s chief business advisor Maurice Newman and published in News Corp’s The Australian. Newman founded the neoliberal Centre for Independent Studies, is a former chairman of the Australian Broadcasting Corporation, and is currently also pushing a radical austerity agenda including cuts to wages, education, and disability funding. Considering the open secret that business virtually runs this country, his new position could be described as the unofficial Deputy Prime Minister. According to the Australian Financial Review, “the best way to view Newman’s speech is as an exposition of what Abbott might have said had he been freed of the political constraints that go with being in government”. Newman claims the IPCC “has applied mass psychology through a compliant media” to convince us global warming is real and “champions compensation for developing countries”. In reality, the IPCC reports are dull, science-based, err on the conservative side, and make no political recommendations; the media regularly publishes opinion pieces like Newman’s; and most Australians are in one or another stage of denial about human-caused global warming. He accuses the IPCC of “dishonesty and deceit”, referencing the fake scandals of “Climategate” (debunked here), “Himalayagate” (debunked here), and “Amazongate” (debunked here). Newman repeats the oft-heard belief that global warming has stopped. In reality, a recent study found that when satellite measurements are used to account for a lack of weather stations in the Arctic, the global surface temperature has continued rising at the same rate since 1997 as since 1951. This continued warming is within the range of model projections and despite a cooling influence from natural factors such as ocean cycles. In any case, the atmosphere is only one part of the climate system; most of the heat from global warming goes into the oceans. The heating of the oceans, the rise of the seas, and the melting of ice have accelerated, in the latter case faster than any model predicted. In total, the Earth has accumulated 2 trillion Hiroshima atomic bombs’ worth of heat since 1998. Newman predicts the Earth will now cool into a new little ice age, citing the denialist European Institute for Climate and Energy. In reality, the greenhouse gases humans have added to the atmosphere will continue to warm the Earth for decades and prevent an ice age for millennia. Newman complains about “hundreds of billions of dollars spent annually” on climate action, but fails to mention the world spends $2 trillion annually on fossil fuel subsidies. He claims Germany’s renewable energy policy “has not reduced CO2 emissions in Europe by a single gram.” This is only true in the sense that the EU’s emissions trading scheme subsumes everything else; Germany’s actions are at least ensuring that money is going to zero-carbon energy technologies rather than “low-carbon” fossil fuels. He also claims it has had a huge impact on electricity prices (it has actually reduced wholesale electricity prices) and complains about reduced profits for fossil-fuel-fired power plants (surely evidence that the policy is working). Similarly, Newman says the Australian carbon tax and renewable energy target have “been a major factor in the decimation of our manufacturing industry” by raising the cost of energy, but offers no evidence to support this claim. In reality, the main reason for rising electricity prices is over-investment in poles and wires. Finally, Newman spins governments’ half-hearted attempts to promote wind power as a failure to protect public health. In reality, there is no evidence that supposed “wind turbine syndrome” is anything more than psychological. Newman concludes that “the climate change delusion… favours the rich and politically powerful at the expense of the poor and powerless”. This statement is Orwellian in its reversal of reality: the richest and most powerful members of our society are beneficiaries of the fossil fuel boom, and the poorest are dying from increasingly extreme weather. I don’t see any climate scientist or activist appointed as a personal advisor to the Prime Minister. Newman has long been a denier. As ABC chairman he sought to “balance” mainstream climate science with denialist views. Last year he hinted the government should axe climate research at CSIRO and the Bureau of Meteorology because “They continue to propagate the myth of anthropological [sic] climate change and are likely to be background critics of the Coalition’s Direct Action policies”. The Greens have called on Abbott to sack Newman and cease his program of climate deregulation. To my knowledge, Abbott has not commented on Newman’s views. Although Abbott rhetorically claims to accept the science of climate change, he, his colleagues, and his allies have a long history of spouting denialist talking points. Most famously, in 2009 Abbott reportedly said the science of climate change is “complete crap” but “the politics of this are tough for us”. This makes McLean sound far more credible than he really is. His peer-reviewed papers have been debunked. Being an IPCC reviewer means little, because anyone can sign up (notwithstanding the supposed IPCC conspiracy). The International Climate Science Coalition is a denialist group funded by the Heartland Institute, an American right-wing think-tank in turn funded by the fossil fuel industry. 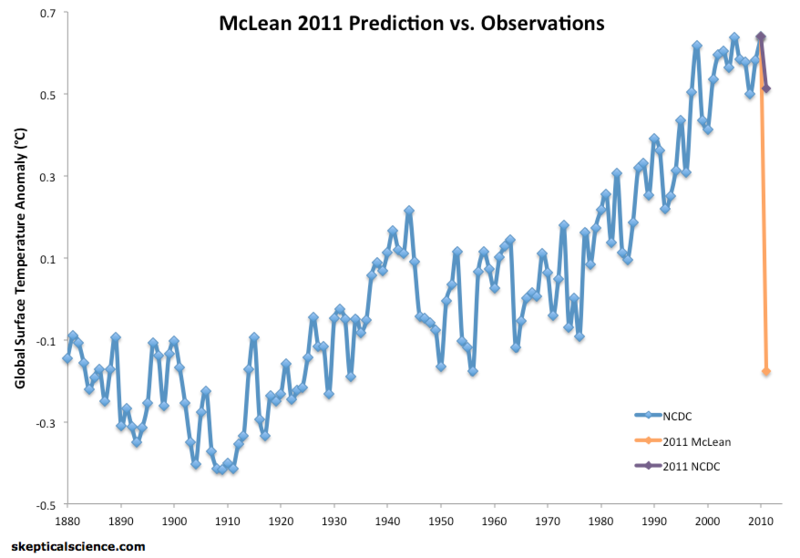 And it will soon become apparent how competent McLean is at analysing climate data. McLean tries to position himself in the middle between two extremes represented by Newman and David Karoly. In reality, Karoly is a respected climate scientist while Newman and McLean are both on another planet. McLean describes the Intergovernmental Panel on Climate Change (IPCC) as a “UN-sponsored lobby group created specifically to investigate and push the ‘man-made warming’ line” and its reports as “exaggerated science with a large dollop of politics”. In reality, IPCC reports are simply a synthesis of vast evidence published in peer-reviewed journals, and its reports have systematically underestimated global warming. McLean notes “government representatives discuss, negotiate and eventually agree on the wording of each sentence” in each IPCC report’s Summary for Policymakers. But most governments are expanding the fossil fuel industry so would block any alarmism from the IPCC (the Reagan administration advocated its creation for this very reason). Why would the Abbott government, elected on a platform of climate deregulation, participate in an IPCC conspiracy? McLean claims that the IPCC’s mandate allows it to examine only human influence on climate; that its conclusions are based on flawed climate models; that human influence is less certain than it claims; and that the “Climategate” emails prove there is a conspiracy to keep skeptical views out of its reports. Of course, the IPCC does account for natural influences on climate as it is necessary in order to determine the level of human influence. Its conclusions are not based on models alone, but corroborated by real-world observations and geological records (and of course the models are flawed, because any model of anything is flawed). Its confidence is based on measurements showing humans have caused around 100% of global warming since 1950. Multiple independent inquiries have found the IPCC authors whose emails were hacked did consider skeptical views and did not behave improperly. McLean goes on to complain about the IPCC’s conclusions being promoted by the UN, government bodies like the “now-privatized Climate Commission”, environmentalists, renewable energy “vested interests”, and scientists “whose income and reputation rest on the IPCC’s position”. In reality, all these independent people and organizations have drawn similar conclusions not because they parrot the IPCC but because it is where the evidence leads. Scientists’ jobs do not depend on the IPCC; authors are employed by various scientific institutions and not paid for IPCC work. And far from promoting government policy, the Climate Commission embarrassed the Labor government which created it by stating the need to leave most fossil fuels in the ground (an implication the IPCC has never explicitly spelled out). Australian newspapers (not to mention the Prime Minister) should stop giving a platform to global warming deniers whose specious arguments are long since debunked, and instead spend more time publicizing the mountain of scientific evidence supporting the conclusion of 97% of climate experts that humans are warming the planet. And it’s not “anthropological”, it’s anthropogenic. This rediculouse curve was hidden for years till they where oliged to show it. Lets wait for the next century interval to make some opinion. The climate science has the features of the Opera scientific group who have spent hundreds of millions for Einstein`s laurels.